Green Dragon -- Workington -- Workington -- Cumbria / -- 2.9.2009 -- Innsign - stage coach at the door of the inn. 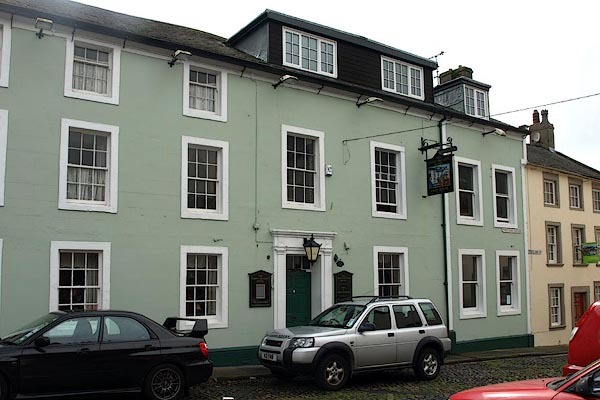 [Workington] ... inns, Green Dragon, New Crown, and King's Arms. INNS. 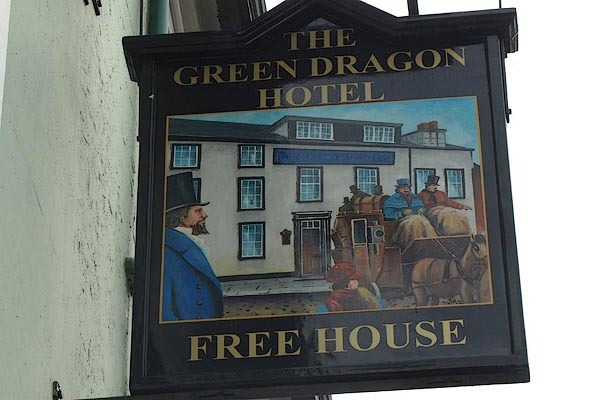 ... Workington, Green Dragon, King's Arms. Hotel. Late C18 or early C19. Painted incised stucco walls, with angle pilasters, on moulded plinth. Graduated greenslate roof with painted and rendered chimney stacks. 3 storeys, 3 bays, with right 2 storeys, 4 bays under common roof. 6-panel door with overlight in pilastered doorcase, the frieze with urns. Sash windows with glazing bars, those in end bays right without bars, all in painted stone surrounds. Right portion has flat C20 dormer windows. Taken over by the Central Control Board in 1916 and returned to private ownership in 1973.